Grocery shopping is one of those don’t-want-to-but-have-to tasks in life. It takes too long, costs too much, and usually involves way more patience than you bargained for (we’re looking at you, dude in front of us with a cart full of individual yogurts and five price checks). While we can’t help the situation with the slow guy in line, we can help with the time and money parts of your trip. Here are three costly grocery shopping habits and how to break free from them. 1. The Habit: We shop when everyone else shops. According to the American Time Use Survey, most of us do our food shopping on Saturdays and Sundays. To make matters worse, we arrive at the store between 11 a.m. and 1 p.m. (That’s probably not surprising if you’ve ever been in a midday, near-fatal shopping cart accident.) And because it’s so crowded, we’re also spending a lot of time in the store—nearly 50 minutes on average. By the time we’re done, we’re just grabbing stuff to get out of there! The Habit-Breaker: Shop during non-peak hours. If you have the time to shop during the week, try a less busy day like Monday or Tuesday. And go before 4 p.m. or after dinner to avoid the after-work crowd. If weekend shopping is a must for you, that’s fine! Just pick up your thinly sliced turkey before (or after) the entire town descends upon the deli. In most cases, that means going before 9 a.m. or after 5 p.m.
2. The Habit: We go to the store more than once a week. 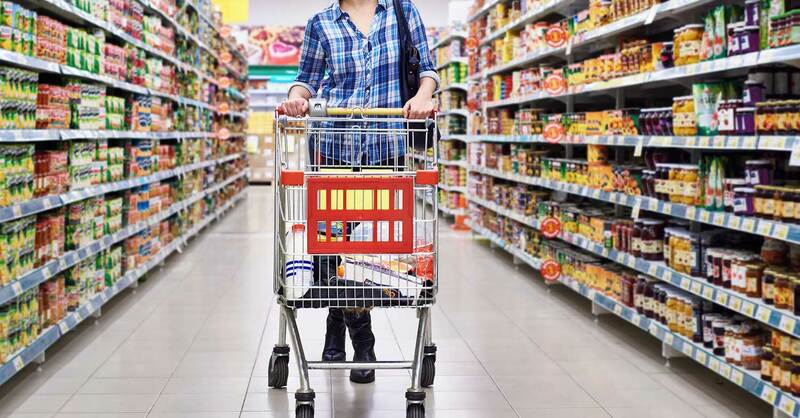 Statista reports that Americans visit the supermarket 1.6 times per week. That probably doesn’t shock anyone. We all know what it’s like to get home, start cooking a fabulous meal, then realize we’re missing a key ingredient! That means hauling it back to the store and getting whatever we need—plus the other five things we forgot for tomorrow night’s meal. That can get expensive fast. The Habit-Breaker: Make a meal plan before you go. The simplest way to save time and money at the store is to plan out all your breakfasts, lunches and dinners before you leave the house. This may seem like a boring task, but it’s actually freeing! Think about it: You only buy the exact ingredients (plus a few snacks and drinks) you need for those specific meals. No more What sounds good this week? internal debates while you’re in the frozen food aisle. 3. The Habit: We waste a ton of food. We’re wasting about $1,500 worth of groceries each year, according to Consumer Reports. That stinks! You paid good money for that wilted lettuce in your fridge drawer and those black bananas on your counter. The problem is that we buy too much food—fully intending to use it—and then we go out to eat a few nights or forget our lunch a few days. Pretty soon, we’ve got 20 bucks’ worth of not-so-fresh produce. The Habit-Breaker: Match your budget to your calendar. Before you make your food plan for the week, pull up your social calendar. If you’re having dinner with friends and a date night with your spouse, that’s two fewer meals you need to plan for this week. Put that grocery money toward your favorite pizza joint or pad thai place instead. Because let’s get real: So. Much. Easier. Break these three costly grocery shopping habits and you’ll gain more time in your schedule and keep more money in your wallet. Not to mention, you’ll get rid of a cartload of stress! And as for that slow guy in the checkout lane? Sorry, he’s not going anywhere. Put your time to good use by tracking your transactions in your EveryDollar iPhone or Android app while you wait. That way, he’s actually helping you save money! What a guy. Make it a habit to spend only what you’ve budgeted with the help of the EveryDollar app. It’s free to use and takes less than 10 minutes to set up!